Ubiquitin signalling plays a key role in the regulation of cellular responses. Our aim is to uncover cellular processes and the components that are targeted by ubiquitination, with a focus on the immune response. Our studies have revealed that PUB ligases interact with components of the vesicle trafficking. These include subunits of the exocyst, an essential complex that mediates the tethering of post Golgi vesicles to the plasma membrane for exocytosis. During the immune response, targeted subunits are ubiquitinated and degraded, a process that contributes to the dampening of cellular responses and the maintenance of homeostasis. Model of PUB22 regulation and dampening of the immune response. 1) PUB22 exists as a dimer that mediates constant autoubiquitination in trans, mediating its degradation and maintaining its levels low. 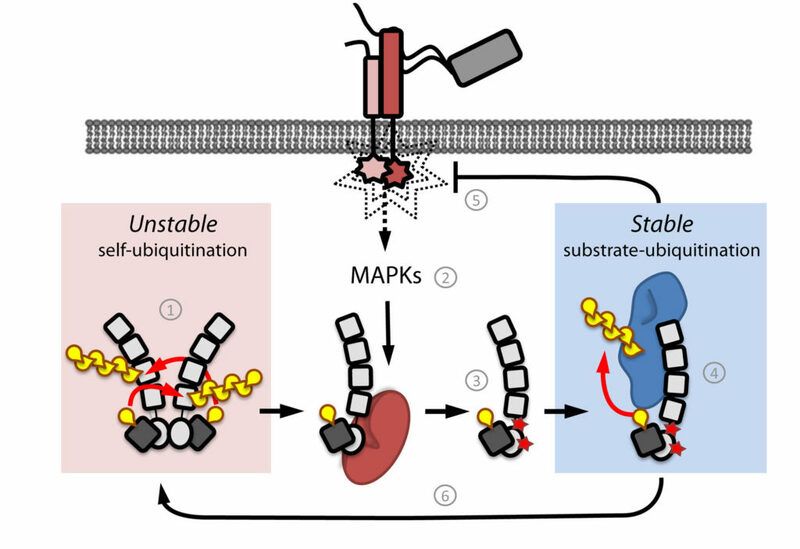 2) Upon infection, immune signalling is triggered and MAPK cascades are activated. 3) Activated MPK3 (red) phosphorylates PUB22 at residues T62 and T88, inhibiting dimerization. This results in a non-autoubiquitinating and stable monomeric PUB22. 4) Increased stability of the monomeric PUB22 allows it to engage substrates such as Exo70B2 (blue). 5) Ubiquitination of PUB22 targets leads to dampening of the immune response. 6) Finally, depletion of substrates and/or dephosphorylation, may allow dimerization and thus, autoubiquitination and finally degradation.